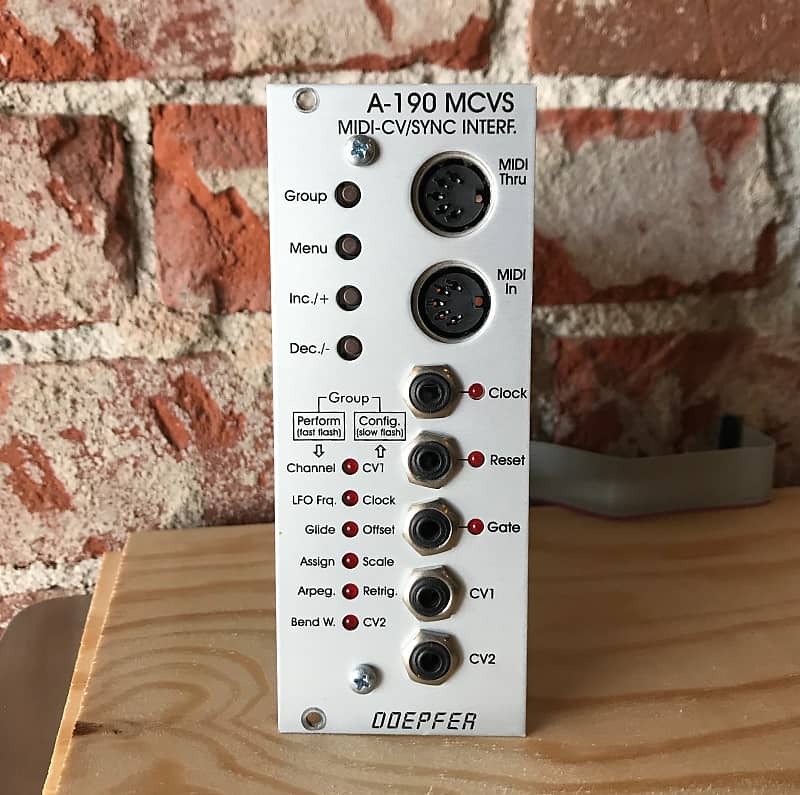 Module A-190 is a MIDI-CV/SYNC Interface, with which you can control any A-100 Module which has CV and gate/trigger input sockets by MIDI. The A-190 has two Digital-to-Analogue converters (DAC for short), which put out control voltages from 0 V to +5 V, so that you can control not just the pitch, but also another voltage-controllable parameter on the A-100. DAC 1 is 'hard-wired' to receive MIDI note messages and convert them into control voltages available at CV output socket CV 1. The DAC has 12-bit resolution, which gives excellent tuning resolution (in steps of 1/4096th). As a rule, DAC 1 will be used to control VCO pitch. DAC 2 can be assigned to your choice of MIDI controller. 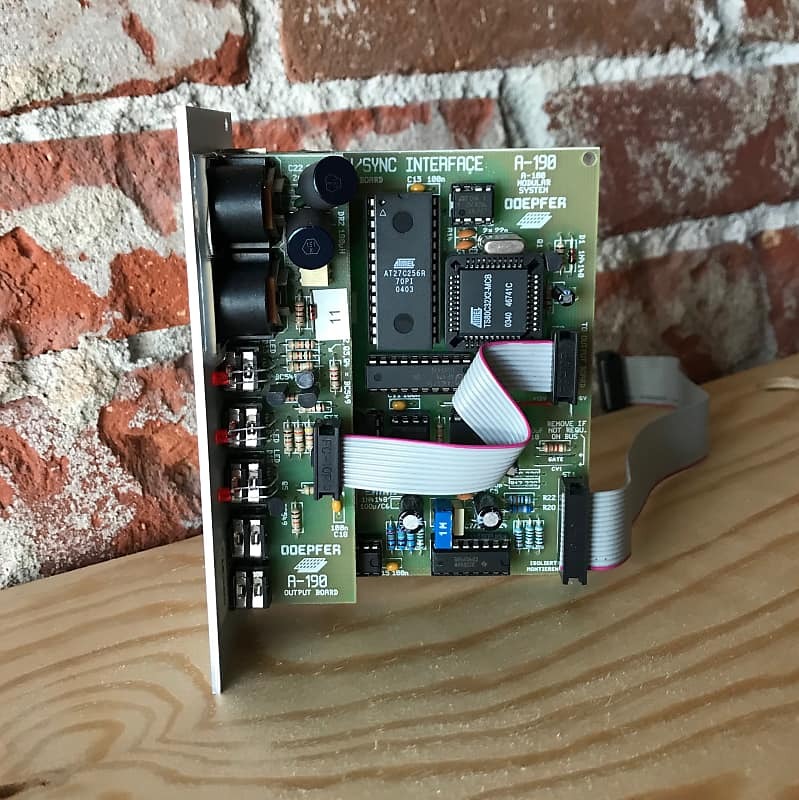 This DAC has 7-bit resolution (1/128th steps). Its output is available at CV 2, and can be used for voltage control of any suitable module (eg VCF, VCA, etc.). The Gate output has 0/+12V voltage level. The A-190 also has a clock output (0/+5V level), controlled by MIDI clock. This can be divided down to provide a variety of clock outputs, and enable older sequencers or drum machines to be synced to MIDI. A Reset Output (0/+5V level) provides control of the A-160 / 161 Clock Divider / Sequencer or can produce MIDI-synchronised gates (for instance on an ADSR). MIDI START or CONTINUE messages make the voltage at the Reset output go low, and MIDI STOP messages make it go high. In addition, the A-190 allows for portamento (glide) and pitch-bend, and provides a software LFO. These functions can all be switched on and off or altered by MIDI controllers. All control parameters can be saved in non-volatile memory. Attention: A-190 requires an additional +5V power supply with 50mA e.g. the low-cost 5V adapter !